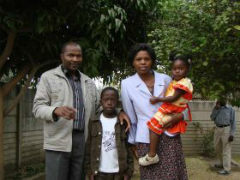 Since 2008 BHW has been in a developing relationship with three brothers and their families in Zimbabwe. One of the brothers Victor Chirima and his wife Deliwe pastor a church in Norton, a small town 40 km out of Harare. The church congregates in a facility at a school called Vimbai Primary School. Through interaction with parents and staff, Victor discovered that there was a special class (called the resource unit) for physically and intellectually challenged children. Victor was recently invited by a Christian school teacher, Edith, to come see her school class. She is in charge of 27 handicapped children. He was shocked by their circumstances and wants to do something about it. The teacher is keen to be part of it. She is like the mother to these children and tries to help them way beyond the call of duty. The children are not well treated by the other children or even the teachers. They have few resources, many need wheelchairs and other specialised equipment and the parents are not well able to provide it. They are despised and looked down on. The school is a conventional government primary school with basic but limited resources. It has a standard administration system but has not been able to sustain this special unit from government funds. This is the only school in Norton that has a resource unit where these handicapped children are enrolled. The resource unit has four teachers (Edith is one of them) and has opened an opportunity for Victor to minister to the children. The plan is to provide wheelchairs, mattresses, books and other school materials, and benches and desks for the children. Sports equipment and sports clothing including T-shirts, shorts and track suits will allow them to attend special sporting days. Also included are some teaching aids, a TV, DVD player and radio. There may also be enough to assist them to attend some special education visits. In 1999 Victor and Deliwe shifted from Harare to Norton to pastor a church there. As they visited around the community they discovered a lot of poverty and quickly realised that to be a pastor would require a lot more than preaching sermons. The church could not support him and he started an electric motor rewinding business which went well for a while but has now collapsed. They tried to support the poor from the income from the business and were able to do that until the business faded. Deliwe then started a business cooking food for a local company. She makes and delivers the food each day using her basic household equipment and this generates a small income, between US$15 - $25/week. In 2008 Victor and his brother Elecson had the opportunity to attend a conference in Kabwe, Zambia. Through interaction with other missionary workers it became clear to them that there was a lot a church can do to support their community. They were able to visit Maplehurst Farm (ZAM21) and also met with BHW's Field Director which was the start of our relationship with them. In 2011 we provided financial support for the Tariro Support Group (ZIM01) and in 2013 Victor approached us with a proposal to help these disabled children. The immediate beneficiaries will be the 27 children and indirectly their families. Victor’s plan obviously involves the children, but he intends to work with the parents and guardians to encourage and support them as they bring up disabled children. Few of them have any skills or training in this area. The school will also benefit indirectly. Victor has a real heart for this community and these children and a passion to show God's love in a practical way. He and his two brothers are incredibly capable men and form a strong team. From their limited resources they are already helping as many people as they can and have a very clear vision of how they can best empower these people. Victor is the key person in terms of having a vision for the needs of these children. He and his wife Deliwe shifted to Norton in 1999 and are pastors of the Gospel Assembly there. They have two children, Lavern (a boy) and Enarah Ruvimbo (a girl). Prior to becoming a pastor Victor was an electrical engineer. Edith Kujenga is one of the four teachers in the resource unit. She is a Christian and has a special interest in the children. She has been interacting with Victor on many issues of concern. Edith is a widow and is the mother of two boys and a girl. She is a teacher by profession, with a Diploma in Special Needs for Intellectually Challenged. To provide love, care and practical support to the 27 disabled children in the resource unit at Vimbai Primary School. A one-off amount of US$7,700 was provided in 2014 for them to purchase the necessary equipment/resources. Currently no further funds are required.